When you think about your dream kitchen, the word small usually doesn’t pop into your head. Unfortunately, for some of us, this is the reality. But just because the square footage of your space isn’t big, doesn’t mean you can’t trick yourself and other into thinking it’s bigger. Glass-front cabinets – Glass fronts open up the space of your kitchen. 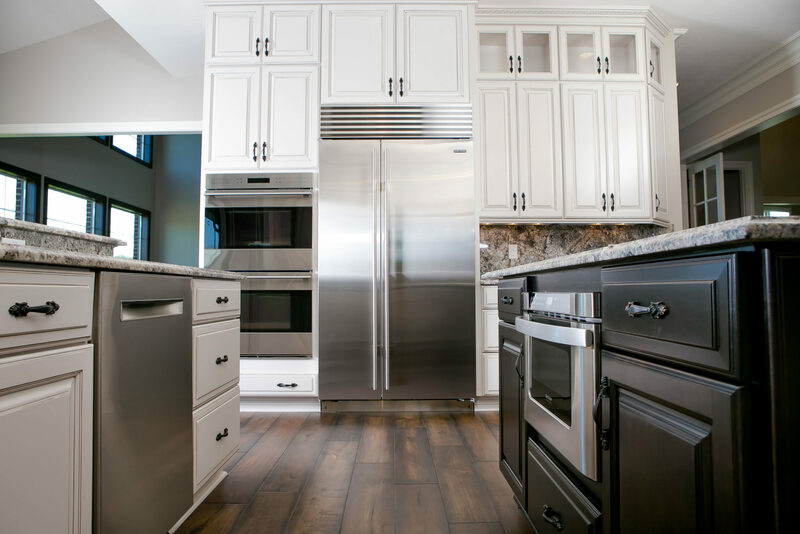 Your eye will travel through the cabinet to back making your kitchen look more expansive. Minimize personal touches – Clutter is the first thing anyone notices when they walk into a small space. Keep decorations to a minimum. And any decorative touches you do add should be small and not take up too much room. Think vertically – Draw the eye upward with cabinets that reach all the way to the ceiling. Not only will you add storage space, but it will create the illusion that the ceilings in your home are taller. Organize by how often things are used – Whether it’s appliances or pantry items, think about how often your grabbing for things. Store your plates and glasses near the dishwasher or sink so it’s easy to load and unload. Keeps spices and oils near the stove so they’re easy to grab when cooking. 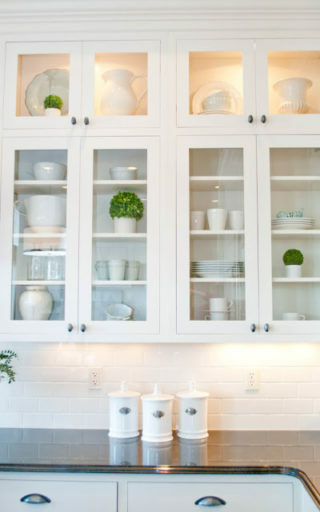 Use walls for storage – Your counter space is limited and your cabinets are filled. So where to next? Your walls. Use hooks to hang mugs. Instead of a butcher block to put knives, put a magnetic strip on a wall by your stove and hang them up. Light, Light, Light – Keep your kitchen space more open with light colored cabinetry and flooring. Dark spaces immediately trick the eye into making them look smaller. If you can add windows to flood the room with natural light – Do it! Adding more lighting fixtures can create the same effect.